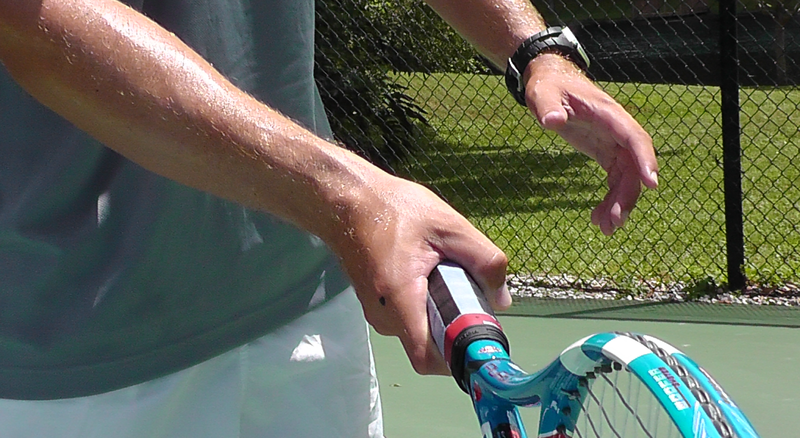 An eastern forehand grip (3) should be used. A semi-western (4) grip is also acceptable as long as the student doesn’t end up slipping all the way under to a full western (5). Using a full western grip will have a host of future drawbacks. The eastern forehand grip can be modified to the bottom side of the third panel. It will just help you close the racquet a little more then a true eastern. Roger Federer and Juan Martin Del Potro are two top pros that use an eastern forehand grip. 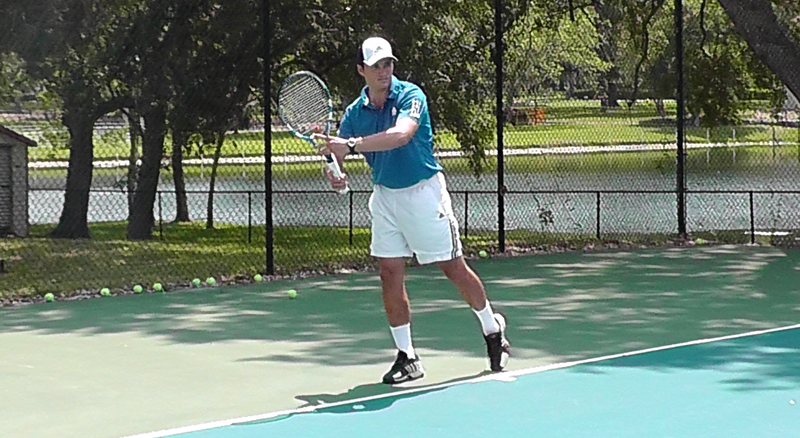 The eastern forehand allows for a more all court game. It allows you to really drive and penetrate but also allows you to generate sufficient spin when getting the racquet head way below the ball. My coach used to have us drop hit balls into the side-fence with our hand, then progress to choking the racquet up and then holding it all the way down on the grip. The idea was that the racquet was the extension of your hand and your hand was hitting the ball. This is often referred to as ‘palm guidance’ that can only be achieved with an eastern forehand grip, as this is the only grip that allows you to play with the palm facing your target. The palm faces upwards on both the semi and full western grip. The shape of the swing should match the shape of the court, which is less then 20 degrees wide. In order to do this one should have a vertical swing with a lifting motion. Turn as soon as you know it’s going to be a forehand. You should be turned by the time the ball has crossed the net. During the unit turn the racquet should be up with the left hand staying on the racquet for at least the first 90 degrees of turn. You then continue to turn the shoulders making sure that the racquet does not go past the right shoulder. As the ball is bouncing the racquet should free fall to about your knees. You then lift up through contact, contacting the ball around about waist height. Complete the contact zone with the wrist still fixed in this bent position until you get your hand to eye level. This is will allow you to have a longer hitting zone and also to play from the longer lever the shoulder rather than from the forearm. The swing should also go from inside to outside. As you turn the racquet should be closer to your body, but with you elbow away not touching your side, then as you go to swing forward the racquet should start to get further away from your body, there should be an outstretched finger to thumb space between your upper arm and upper body. There is a direct relationship between the power generated and the distance between your body and the contact point. The greater the distance the more power you will generate. Swinging inside-out and having the racquet swing up/lift through contact are the two necessary components to hitting true topspin. 3. Lift at contact – your front leg should be straight. One of the most common mistakes is for the head to lift too soon. You will see when someone is hitting a golf ball or kicking a football/soccer ball. The brain is a head of the hit, so it is common to want to look too soon. You need to keep your eyes transfixed on the contact point. This will help you keep your head still and prevent it from lifting. As soon as you lift your head your body will follow and so will your swing. A kinesthetic feedback is to wait to feel your shoulder hit your chin. Not only will is help you keep your head down, but it will also help prevent you from pulling off the shot too early, therefore increasing your contact zone.